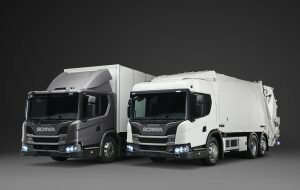 At Scania’s HQ in Sodertalje, the Swedish truck and bus brand launched its latest truck generation – the L-Series – to support customers in dealing with urban challenges. Urbanisation and growing cities calls for new, sustainable transport solutions. At Scania it has identified five main challenges that urban operators are facing and have developed solutions that will help them deal with these challenges while maintaining sustainable profits by the best total operating economy. Scania has now completed the introduction of the new truck generation for Europe. The final leg, focusing on applications for the Urban segment, has a very rich content with new cab series, new engines and new services, providing potential Scania customers with almost limitless opportunities to get a tailor-made solution. Apart from the new low-floor L-Series, an Urban P-Series cab was revealed along with a new 7-litre 6-cylinder diesel and revised 9 litre and 13 litre Natural Gas engines. Full details from the event in the June edition of Fleet Transport.